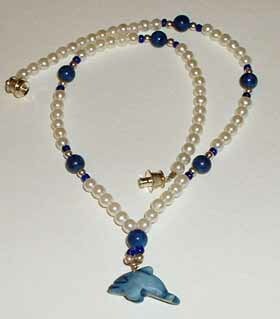 The free bead necklace pattern is simple. These necklaces were constructed from a single piece of SoftFlex wire that begins with a crimp at the clasp, goes through half of the beads, then through a center bead that will begin the drop to the pendant, then through 2 or 3 small beads before going through the pendant and through another 2 or 3 small beads, then back up through the center bead. Then the second half of the beads are put on, followed by crimp and clasp. A center charm or pendant. The choices we has available included stone Zuni bears, stone dolphins, stone or metal crosses, and assorted brass charms and pendants. Accent beads. If you have been doing the previous classes with a group, many will be leftovers from previous projects, including fire-Polished crystals. Seed beads and/or other small-to-medium sized beads. We had 4mm fossil beads, hematite, plastic pearls, plus lots of donated miscellany. Sample necklaces made according to these directions. I had bagged up small sets of accent beads from the donated materials that were available. I had also bagged necklace-size quantities of small beads that could be the major part of the necklace. This class was pretty easy for the girls and they felt pretty accomplished when they completed their necklaces. The little pendants I had collected included a few crosses and they turned out to be the most popular choice for this particular group of Mexican-American girls. If I had guessed this in advance, I would have found more crosses for them. At the end of this class, I reminded the girls that next week would be our last class and I encouraged them to bring back some of their earlier work so we could include it in our graduation display.